With the insane popularity of Kyogre who averages 78% usage (58% on Pokemon Showdown and 98.03% on Battle Spot), any Pokemon that can has a positive match-up versus it is very pivotal for teams, which is why Ludicolo has seen a large surge in popularity where its constantly in the Top 10 of usage on all teams. This guide will look into Ludicolo and why its seeing use in the VGC 2017 format. Swift Swim - "Doubles the user's speed stat when in the Rain." With the insane popularity of Kyogre, being able to outspeed it and threaten back with a super-effective Grass-type move is very important. Compared to its two other abilities in Own Tempo and Rain Dish, Swift Swim has always been the best and most popular ability and the one you should expect on every Ludicolo you fight. 80 HP / 70 Defense / 100 Sp. Defense is pretty average defensively. While Ludicolo won't be surviving a large variety of hits, it can be trained pretty bulky to survive some super-effective hits and other powerful moves. 90 Sp. Attack is pretty decent but nothing amazing. With boosting items like a Life Orb or even Z-moves when they're legal can allow Ludicolo to become a very large damage dealer. Water/Grass is a great typing both offensively and defensively. With only 3 weaknesses to Flying, Poison, and Bug which aren't very common types apart from Poison. This mean Ludicolo will mostly only be taking neutral attacks which gives it the best chance to take hits. Resisting Ground, Steel, and Water-type moves are very helpful as Steel has become much more common with the popularity of Xerneas and Water gained popularity thanks to Kyogre. Sunny Day is very interesting. The idea is with Swift Swim active, Ludicolo can outspeed Kyogre to set the sun to weaken its Water-type moves to threaten it very safe with a powerful grass type move like Grass Knot or Giga Drain. Ice Beam is great to threaten the Grass-types like Tsareena and Amoonguss. Your choice in Water moves from either Scald for the burn chance and 100% accuracy, or Hydro Pump for the strong damage output. Which one you value more depends on comfort. Fake Out is great for the flinch chance. Fake Out is great for the chance to allow Ludicolo's partner to set-up which can put you in an amazing position to win games easier. Life Orb is great for added damage. Most Pokemon after taking your Life Orb boosted moves will either activate their pinch berry or simply KO them which means you can follow up with another attack to pick up the KO. Assault Vest can allow Ludicolo to survive the powerful special hits better like Xerneas' Moonblast and Yveltal's Oblivion Wing to do its job of checking Kyogre better. While a niche option, King's Rock can be used alongside Fling to flinch a Pokemon of your choice. With 7% usage on BattleSpot, some players are finding some form of success with it to warrant being talked about. The final item in Focus Sash is simply good to allow Ludicolo to survive 1 big hit it otherwise can't. If you run the Focus Sash, be wary of priority moves like Fake Out that can break it as that can cause trouble for your Ludicolo. The first set is very offensive. 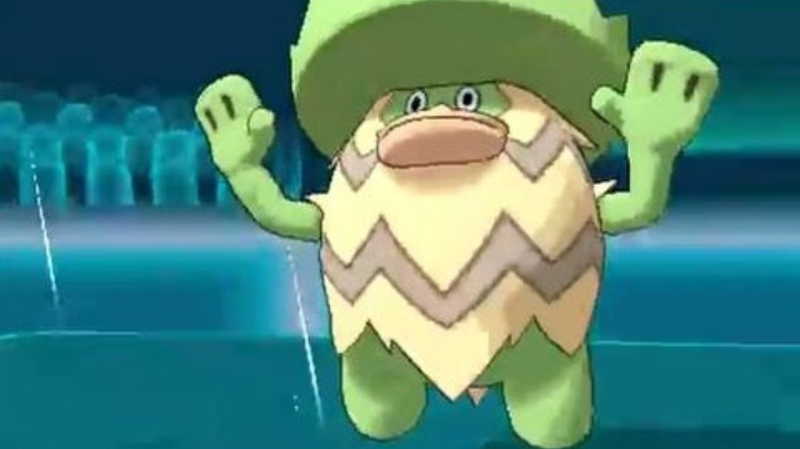 The main goal of this Ludicolo is to cause as much damage as possible before going down which holding the Life Orb can aid in accomplishing this. Your water move choice in either Scald or Hydro Pump is great for a powerful water type move that can be powered up in the Rain. Boosting its damage output with the Rain and Life Orb can lead to a very powerful hit that rivals the power of a Rain-boosted Hydro Vortex. The first move in either Scald or Hydro Pump like said above depends on whether you prefer Scald's 30% burn chance or Hydro Pump's power. Grass Knot is mainly for Kyogre and Groudon. Due to their massive weight, Grass Knot will deal more damage compared to other Grass moves like Giga Drain and Energy Ball. Fake Out is great to allow your other Pokemon to set-up or try and pick up an important KO. Ice Beam is great for all the Grass-types in the format like Tsareena and Amoonguss that you otherwise can't damage for that much, but you can use Sunny Day to kill Kyogre's Rain. The second set is a bulkier one that uses the Assault Vest to survive some very strong special hits, including +2 252 Sp. Attack Modest Xerneas' Moonblast, Yveltal's Oblivion Wing, and 20 Attack Incineroar's Flare Blitz in Sun to name a few attacks this EV Spread was built for. The idea is if Ludicolo can survive some powerful attacks, it's able to do its job of dealing a ton of damage to the Pokemon it needs to. The moves largely don't change. Scald, Grass Knot, and Fake Out are amazing moves on Ludicolo that are largely stuck in 3 out of the 4 slots on Ludicolo. The final slot in Ice Beam or Icy Wind depends on whether you want the power of Ice Beam or the speed control benefit of Icy Wind. Kyogre's Drizzle ability activates Ludicolo Swift Swim ability to help it to sweep thanks to its massive speed and rain-boosted Water-type moves. Ludicolo can also take down opposing Kyogre very easily. Since Groudon is weak to Water-type moves, Ludicolo can hopefully in the rain use its amazing speed to use Sunny Day if Groudon is stuck in the rain. Ludicolo's Grass-type moves can also take down opposing Water-types like Kyogre and Tapu Fini. Xerneas enjoys the access of a fast Fake Out to help Xerneas use Geomancy to help sweep through teams. Ferrothorn's strong special bulk allows it to take very little from water type moves while being able to out-damage it with Power Whip. Yveltal can use its Dark Aura boosted Dark-type moves and Oblivion Wing to threaten KOs on Ludicolo. A Scald burn is annoying, but barring that, Yveltal shouldn't have too much trouble. Although Ho-Oh fears Ludicolo's water type moves, Brave Bird does threaten a ton of damage and without Intimidate, can easily KO Ludicolo. Dialga and Palkia both resist Ludicolo's Water and Grass-type moves and can threaten with either Dragon Pulse or Spacial Rend respectively to easily out damage Ludicolo.